"Don’t throw your batteries in the trash! " 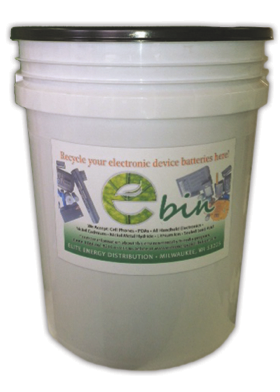 Recycle your old household batteries or electronics properly with the E-Bin! Have you ever wondered were to dispose of your old camera battery or your TV remote batteries? In the convenience of your own home you can now recycle responsibly. Simply empty your junk draw of all small battery types and old electronic devices such as pagers, PDA’s, Gameboys, Nintendo’s, or any handheld electronic devices and place into one of our E-Bin’s…It’s never been easier! *Includes shipping cost, universal waste approved bin and label. This bin would be great for any home or office. Proudly display on a counter or put near other recyclable receptacles for maximum usage. Acceptable products to place in the e-bin: cell phones, PDAs and all Handheld Electronics and Rechargeable batteries such as Nickel Cadmium, Nickel Metal Hydride, Lithium Ion, Sealed Lead Acid. Shipping Instructions: Simply add your obsolete electronics and spent batteries. Snap the lid on the top of the bin and ship. Place the pre-addressed/pre-paid shipping label on the bin. Please include your information on the top of this label under the heading FROM. This drum is designed for commercial or high traffic consumption areas. This can be placed near other recyclable receptacles for maximum usage. Acceptable products to place in the e-bin: Cell phones, Computers, Printers, PDA's and most household electronics and rechargeable batteries such as nickel cadmium, nickel metal hydride, lithium ion, sealed lead acid. Shipping Instructions: Seal the lid to the top of the drum. Call 1-414-8216 or email logistics@eliteenergydistribution.com and request a pickup. They will arrange a carrier to pick up at your place of business.